Take BB-8 with you on your daily adventures! This plush backpack is as cuddly as it looks and makes an exciting gift for the Star Wars fans on your list! You’re never too old for a Star Wars backpack and this plush backpack is no exception! The adjustable straps mean this this soft and cuddly backpack can be worn by children or adults and it’s a great way to wear your Star Wars fandom on your sleeve or, more precisely, on your back! 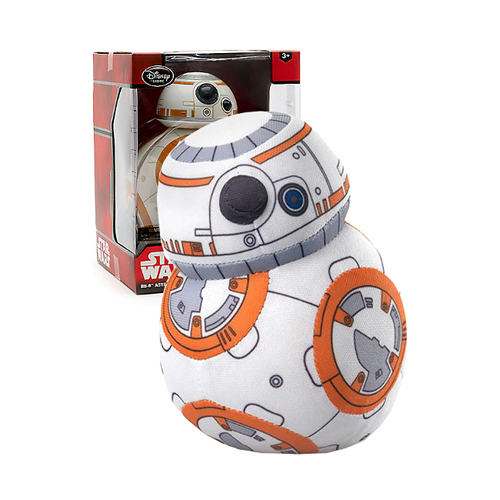 Made from super soft fabric and filled with plush stuffing, when you’re not using the backpack to carry your precious personal collection of “The Force Awakens” collectibles, you can cuddle up to BB-8 for comfort or warmth! 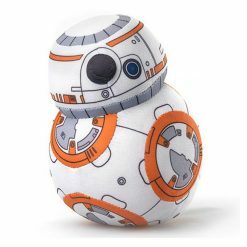 The outside of the BB-8 is a realistic round shape just like the real BB-8 with a nose-like camera structure on the head and authentic looking silvery grey with orange colour markings. The plushie bag has an interior compartment which is accessible via a zip around the top section. Use it to carry Star Wars bits and bobs or your other daily essentials like sunglasses, wallet etc. Younger Star Wars fans can use it to carry beloved toys and favourite snacks. In addition to being a cool conversation starter as an everyday bag, this plush BB-8 backpack could also be added to a Poe Dameron or Rey cosplay, Halloween or dress up costume. 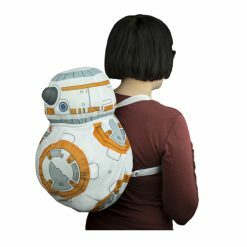 The BB-8 plush backpack is sure to be a big hit with all the Star Wars fans in your family and will be a wonderful surprise for Christmas, Easter or a birthday present.